There are many user-facing Customizer improvements in 4.9, including: drafting/scheduling of changesets, autosave revisions, changeset post locking, frontend public previews, a new experience for browsing and installing themes, updated nav menu creation UX, and the code editing improvements for the Custom HTML widget and Additional CSS. But in addition to all of these, there are also many improvements for developers which will make extending the Customizer much more pleasant. Naturally the change here to the add method is backwards-compatible, and existing code that passes an ID as the first argument will still continue to work. Backwards compatibility is maintained, so existing code that passes props via options.params will continue to be read from first, and then fall back to the new unwrapped options for props. The options.params property is soft-deprecated in 4.9 (using it will raise no warning) but it may be hard-deprecated in the future. So creating controls in JS is now pretty much identical to creating them in PHP, aside from the differences in syntax. 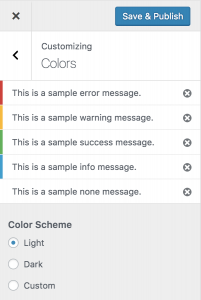 When this ColorSetting is instantiated, the transport of postMessage will not need to be explicitly provided each time. In 4.9, the way settings are passed to controls is getting revamped. Additionally, the symbolic keys supplied for the settings are now more useful in that they can be used to create input element links. Additionally, just as with partials you can pass settings as an array (#36167), where the first item then becomes the default. A plugin could then listen for changes to that control’s setting model to then perhaps store the value in localStorage to persist the user preference for how wide they want their sidebar to be. Being able to construct controls with Value models is a next iteration beyond setting-less controls introduced in 4.5. The WP_Customize_Control::get_link() PHP method has been updated to output a data-customize-setting-key-link attribute with the supplied setting key as its value when the associated setting does not exist. Otherwise, it maintains its prior behavior of using the setting ID as the value for a data-customize-setting-link attribute. The JS logic responsible for linking inputs with settings via elements is now contained in a new linkElements method on Control. Refer back to the “Pane Width” example above where a type of number was supplied when constructing a base wp.customize.Control class. This would not work prior to 4.9 because there were no content templates defined for base control types. This is no longer the case with the resolution of #30738. If you construct a control and supply a type param that corresponds to an HTML5 input type, then the default control template will be used to render the control. Note that for color inputs, one should use the dedicated ColorControl. A control’s template is normally derived by its type; for instance, a Background Position control has a type of background_position and then has a wp.template ID of customize-control-background_position-content. The template is normally output by a control’s WP_Customize_Control::content_template() template after the control has been registered via WP_Customize_Manager::register_control_type(). In 4.9 however, this can all be bypassed as controls now understand a templateId param. For some more examples, see answer on the WordPress Development Stack Exchange. Speaking of WP_Customize_Manager::register_control_type(), the types for panels, sections, and controls now are all registered before the customize_register action is triggered. This means that if you have a plugin that unregisters all customize_register actions in order to create a “blank slate” plugin-specific Customizer, you no longer have to re-register these types to be able to use them. Note that for the twelveHourFormat param you may want to let the site’s own preference determine the value. 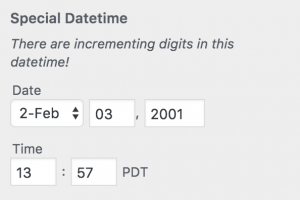 The site’s time_format option is now exported as wp.customize.settings.timeFormat so you can opt to show 12-hour format if this PHP time format contains a, as this is whether AM or PM is shown. The PHP date format is also exported as wp.customize.settings.dateFormat. See core example. wp.customize.utils.highlightButton() is used to bounce a given button to draw a user’s attention. This is used on the save button after changing the status and closing the Publish Settings section. It is also used when creating a new nav menu, to draw attention to the button for adding new nav menu items. wp.customize.utils.getCurrentTimestamp() is the JS-version of a PHP call to current_time( 'mysql', false ). Note that it will attempt to compensate for differences between the server’s clock time and the clock time on the client. wp.customize.utils.getRemainingTime() returns the number of milliseconds until the provided DateTime object. wp.customize.requestChangesetUpdate() now allows an args parameter after its initial data parameter. The args can include title, date, autosave, and force. Calling this method will also now short-circuit with a rejected promise if a request is currently being processed. 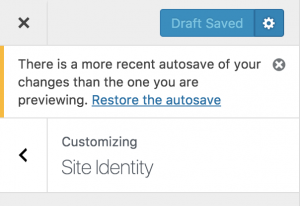 Note that this method is a lower-level version of what the older wp.customize.previewer.save() does when a user hits Save, though the overlap is not complete. Both wp.customize.previewer.save() and wp.customize.requestChangesetUpdate() will trigger a save-request-params event on wp.customize with the underlying request params object provided so plugins can modify the params as required. There is now a wp.customize.previewer.trash() method for trashing any current changeset to reset to the previously published state. An overlay notification (see below) is displayed when the trashing request is made, and once it finishes the Customizer will refresh in a pristine state. In calls to wp.customize.previewer.save(), the request will now be short-circuited if any registered control has an error notification. Previously it would only short-circuit if a registered setting had an error notification. 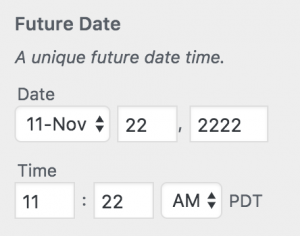 This is used in core for the changeset scheduled date control, to block saving if the user provided an invalid date or one that is not in the future. There has historically been two separate ways that the Customizer has been loaded. The first is just to navigate straight to /wp-admin/customize.php, and this is what happens if you click “Customize” in the admin bar or the admin menu. However, if you would click on “Customize” from the admin dashboard or any of the “Live Preview” buttons on the themes admin screen, then the Customizer would get opened in a full-screen iframe with the URL being rewritten to look like you are at /wp-admin/customize.php even though the previous page was still present under the iframe overlay. There were some advantages to this customize-loader in that it allowed the Customizer to be loaded with a spinner animation as well as being able to be quickly closed by just destroying the iframe. However, there were also disadvantages. It was difficult to maintain the two loading methods, the customize-loader made it extremely difficult to implement browser history for navigation in the Customizer (#28536), and there were accessibility problems with the iframe overlay. The customize-loader also added to the overall weight of the page in the browser’s memory. 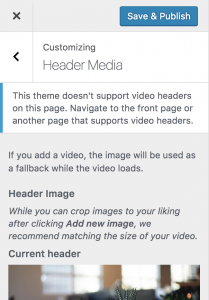 Ultimately, the customize-loader wasn’t necessary because the themes admin screen uses history management to ensure the URL reflects any searches, so the previous search will be restored when closing the Customizer regardless. For these reasons, the use of customize-loader has been discontinued in core (see #40254). It does remain in core for plugins to use, but it may become deprecated in the future. The panes that slide out for adding widgets or nav menu items are ad hoc constructs without being built to be re-usable. 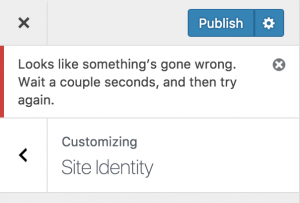 In 4.9 with the introduction of the Publish Settings pane for managing a changeset’s status and scheduled date, this same kind of pane was needed again. Instead of creating another ad hoc pane, the Publish Settings pane is using a brand new “outer” section. This section type can be expanded along with another non-outer section being expanded at the same time. As this was developed specifically for the needs of the Publish Settings, it should be considered somewhat experimental for plugins to use for their own purposes. It can be instantiated in JS via the wp.customize.OuterSection class, or in PHP by registering a section with the outer type. There is also a special overlay notification type that can be added to the global notification area. When an OverlayNotification is added then it will overtake the entire screen. This is used to display notifications for changeset post locking, changeset trashing, theme installation, and theme switching. As with control templates above, notifications can now be constructed with a templateId string param (or template function param) to customize how a given message is rendered, and to allow for a notification to include additional UI in addition to the message (see #37727). This is used in the changeset post locking notification to add the UI for overriding a lock or linking to the frontend to preview the changes. Finally, there is now a wp.customize.Notifications that subclasses wp.customize.Values; this is a collection for Notification instances and it is responsible for rendering notifications, including handling calls to wp.a11y.speak(). Controls, sections, and panels each have setupNotifications and getNotificationsContainerElement methods which will start calling the render method when notifications are added or removed from the collection. Aside: When removing something from a Values instance, a removed event will now be triggered after the value is deleted. Previously, a remove event would be triggered but before the deletion happened. Most of the JS changes have been documented inline with JSDoc, so browsing customize-controls.js is recommended to learn more about the new APIs introduced in this release. And yes, this massive file does need to be broken up (#30277), something that we’ll plan to do as part of a Customizer v2 feature plugin where we work to integrate the building blocks of Gutenberg into the Customizer. 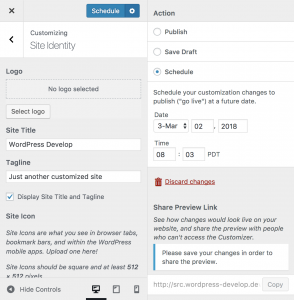 You may also want to look at the Customize Featured Content demo plugin which tries to showcase as many of the Customize JS APIs as possible, and specifically look at the pull request which updates the plugin’s minimum required version of WP 4.9, so there is a lot of code that can be removed since it is no longer required. #39275: Improve wp.customize.previewer.save() for changesets. Props to @dlh for contributing to this post. Massive improvement and great code example on the JS API of the Customizer. Thanks Weston Ruter and the Customize team for this great improvements. These are some great changes and I’m very appreciative that you took the time to write such a detailed explanation with examples. Thank you! Is there an example of how to use the PHP “outer” section type? in PHP by registering a section with the outer type. I did manage to get it to pop when refreshing the customizer instance on load but I don’t understand how you add it to a section using PHP, that opens when you click it (seems to be no “inner” type). I can’t find any documentation on this feature anywhere. Can you give me browser compatibility for this version? I have a client who has an older computer, and her edit buttons have disappeared in the admin (for posts) with this update. I’ve had her clear cache, and have checked the site on numerous “modern” browsers and machines here, but I would love to be able to give her definite browser versions that are required. She’s on an old mac, tried chrome (which hasn’t been supported by her operating system) and firefox. We have people reporting from other countries, too, so it may come up again. I’m wondering if there’s a jquery version that’s not supported by her browser(s).